October newsletter- Advance Voting begins Oct 2! Advance Voting Begins October 2! 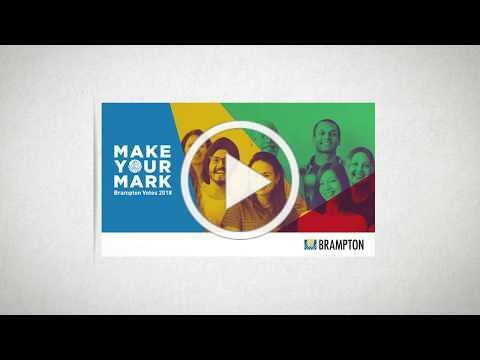 The Brampton Municipal Election is on October 22, but did you know you have the option of voting early? Advance Voting will take place on October 2, 3, 4, 6, 9, 10, 11 and 13. Some of these dates fall during the Thanksgiving weekend, making it convenient for all eligible voters, including students who may be home from school over the long weekend. Voting is easy. If you’re an eligible voter, bring a piece of identification showing your name and Brampton address and your Voter Notice to the voting location. If you did not receive a Voter Notice, you may not be on the Voters’ List , but can be added to the list at your voting location – be sure to bring required ID. You can also register online to request to be added to the list – the online tool is available until 11:59 pm on October 13. All Advance Voting locations will have an accessible voting unit available. Can’t make it to an Advancing Voting location or on Voting Day? You can vote by proxy. You learn more about proxy voting guidelines here. City offices will be closed Monday, October 8.. Participants at recreation and community centres should call ahead as some facilities may operate on holiday hours.